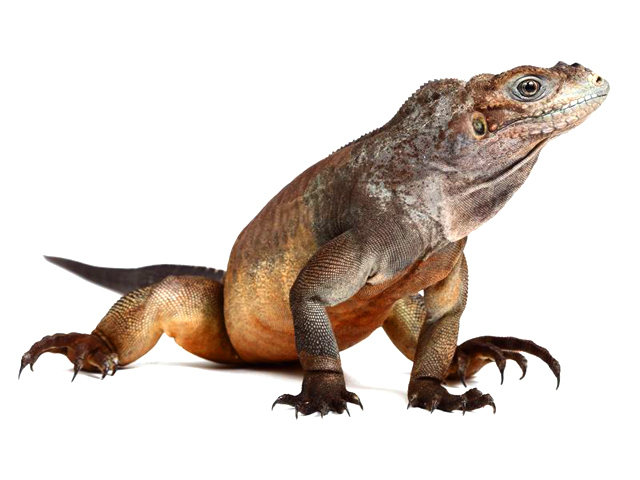 Cyclura cornuta is one of the world’s most magnificent iguanas. Their large, impressive appearance make them a very desirable species to own. They get their name from three horn-like outgrowths on the end of their nose. Male Cyclura cornuta are larger than females and develop larger horns. Males are highly territorial. They are a dusky gray or olive green in color, with barely visible dark cross bands, which allows them to blend in with the rock and scrub brush of their natural habitat. Males are larger than females and develop larger horns. Males are highly territorial. The size of the enclosure for a juvenile should be 1.2 x 0.6 x 0.6 meters (4 x 2 x 2 feet) and 3 x 3 x 1.2 meters (10 x 10 x 4 feet) for a single average sized adult. Strong well fixed branches/logs and rocks add a more naturalistic look to the enclosure alongside with some foliage. Make sure your enclosure is well sealed. It’s recommended to have a decent amount of ventilation in your enclosure. High humidity and high heat make parts of your enclosure very susceptible to mould and bacterial growth. The additional ventilation keeps a nice air flow going throughout the enclosure and helps to stop such things from happening. You can find a nice illustration of a proper enclosure here. Rhino iguanas, especially when hatchlings and or sub adults, need places that they can retreat to feel secure and rest. An animal with no appropriate hide spots will be very stressed out, effecting its eating patterns and overall survival. Due to limited space in an enclosure most of the times, a second hide consumes valuable space. One hide is sufficient and should be located on the cool end as long as a heat source is provided (i.e. Reptile UV heat Projector) to ensure the ambient night temperature does not fall below minimums. I would not place a hide near the hot zone for obvious reasons. Babies are better kept on paper (to prevent them swallowing anything that can cause digestion problems or clog up their small stomachs or cause deadly impaction). We like to use plain butcher’s paper or packaging type of paper or thick paper towels. Personally we do not like using newspapers due to inks that rub-off. Iguanas may get attracted to colored inks and lick that stuff and can swallow thin pieces of paper. As iguanas get older 1-2 years old, you can use regular large iguana substrate. We have been using coconut husk and bark “coco soft”, but you can use moss, astro-turf, sand, clean dirt or nothing. If you will use the astro-turf solution make 2 pads so one can be removed and washed. Besides being more sanitary, it’s a good surface for the iguanas. They will dig if there is something to dig, but not necessarily need that. If you happen to have a female, she will need a large sand box or container for egg laying once a year. And we can help you with info on what works and set-up when the time is right. Nothing replaces real sunlight no matter how great the lamps are. When possible it is very highly recommended to give your rhino iguana access to real sunlight, even if it is 1 hour a day or once a week during the warm days. You may need to have a portable or permanent outside enclosure like a mesh sunning cage. Juvenile rhino iguanas need a hot spot inside the enclosure that gets 41-42 ºC (106-108 ºF) with full spectrum UVB light and a cool side of the cage with ambient temp 26-29 ºC (80-85 ºF). They should spend some time thermo regulating in the hot zone as well as in the cool zone of the cage through the day. Heat may not be needed during the night if the ambient temperatures don’t fall below 21 ºC (70 ºF). You can set the lights and heat to stay on automatically for 12 hours on and give them 12 hours of night time. It’s important to comprehend temperature zoning in an enclosure where ventilation is paramount to establish the enclosure zoning. Enclosures such as tanks of box type with sliding glass door are very difficult to ventilate properly. Most off the shelf enclosures do not provide sufficient ventilation. Thus the enclosure will be near impossible to temperature-zone properly. The caution is if the room is not heat/cool regulated, A. the enclosure must have alternate heat source, and B. A temperature controller to ensure when the room temperature rises beyond a certain point, the basking lamp and other heat generating sources must be turned off else the enclosure’s temperature will exceed what the iguana’s limits in rather a short period of time. It’s good to have shallow water dish available inside the cage. Rhino iguanas usually don’t drink much water if you feed fresh green diet every day. Iguanas extract moisture from the plants. So, don’t be alarmed if you never see your iguana drinking. Ideally 60-85%. You do not need humidifiers inside the cage, rhino iguanas do well with just regular room humidity, even if it’s 40% or less. But if it’s too dry, you can sprinkle or mist the cage once a day or during the shed times to help them peel. Occasional bath is also good and will help to hydrate your iguana during dry season or if it needs help with shedding. In low humidity areas 10 to 30% and consistently <50% it’s recommended to bath regularly part for shedding but more so for the general health of the iguana’s skin. We recommend feeding your juvenile rhino iguana freshly grown organic greens, vegetables, fruits and flowers with alfalfa supplements. It is very important that iguanas get proper nutrition through their lives and especially the first few years. Their favorite greens and vegetables are: collard greens, dandelions, mustard greens, turnip greens, watercress, tatsoi, bok choy, butternut squash, carrots (occasional only), nasturtium flowers or leaves, hibiscus flowers, fresh figs (when in season), mango, papaya, etc. There are many other plants that can be fed to your iguana. We use these proportions when making iguana salad: 80% greens, 20-15% vegetables, NONE-5-10% fruit all year round, plus just a sprinkle of dry alfalfa supplement. We recommend chopping greens in very small bite-size pieces that would fit easily in juvenile’s mouth. Hard vegetables like winter squash should be peeled and pureed into consistency of “baby food” and mixed well with greens. As your iguana gets bigger you can adjust the bite sizes accordingly. Fruits are always popular with iguanas, but please be aware that they will learn to pick the fruit out and will start to ignore the rest of the healthy salad. Fruits are high in sugars and will make small juvenile iguana feel full and not hungry through the day. Especially bananas are very filling and high on potassium. It is too easy to give in and feed them treats all the time, but it will teach your iguana to become a picky eater that can slow down growth and development. We recommend feed fruit not more than 1-2 days a week and only about 2-3 bites to juveniles. You can also use fruit as a treat when teaching your iguana to come to you and taming it. Iguanas will also eat a lot of variety of weeds and fresh tree leaves. They particularly like mulberry leaves, some grape leaves, fig tree leaves, pomegranate tree leaves and variety of other fruit tree and bushes leaves. When handling your juvenile rhino iguana you can expect some squirming, wiggling and clawing. As your iguana gets used to you it will feel more relaxed and less nervous. Juvenile iguanas have very sharp needle like claws, so if you have sensitive skin you should wear gloves. Biting usually is not typical for our juvenile iguanas since we handle them and tame them from the day they hatch. DO NOT grab, hold or pick-up your iguana by the tail, it can break off or get injured. Try to handle your juvenile once a week until the iguana will start getting comfortable with you and then you can handle it regularly. Iguanas thrash less if picked up from underneath, not from the top down. A notation about nail proper trimming should be included. Also a bath routine helps tame the iguana especially if it’s regular. Bath water by the way has a rule: if the iguana is cold to the touch the water temperature should only be a few degrees warmer, then slowly add warmer water. If the iguana is hot to the touch, then a nice warm bath is fine. It’s recommended to spot clean once a day or weekly if iguanas are potty trained. You can read how to potty train your iguana here under Potty Training section. We recommend once a month a total enclosure cleaning. Soap and hot water should be used on furnishings, basking rocks and slate tiles. A vinegar solution can be used to clean the glass of the tank. Make sure that no toxic cleaning materials will be used. And the items washed in soap and water should be thoroughly rinsed with fresh water. Juvenile rhino iguanas should be shedding every few weeks and may even appear that they are constantly in shed for the first two-three years. Shedding will be in segments and various body parts at different times. It is normal. As your rhino iguana grows it will be shedding less often to a point of being once or twice a year and will shed in larger sections. Swallowing too much substrate or larger or sharp objects can cause impaction. Females can retain eggs if proper nesting box is not provided. MBD due to no or bad UVB exposure.